Composition (Bear Posing), 2018. Coloured pencil and ink. His story is almost as compelling as his art. 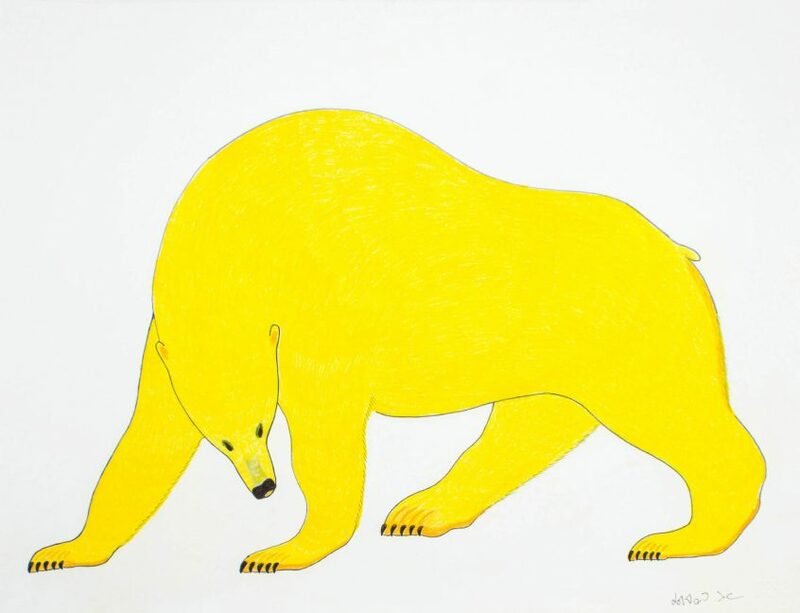 Quvianaqtuq Pudlat – Quvi to his friends – has broken through with his drawings and prints. And Inuit art lovers have certainly taken notice. Quvi’s talent and craft are on display in his striking compositions and impeccable drawing skills. What’s equally remarkable for a new graphic artist is that he’s only been drawing for a couple of years – and he is in his mid-50s. Not that Quvi appeared out of thin air. His parents were both printmaking artists. And his grandfather, Simeonie Quppapik was a well-known artist, printmaker and typographer. Quvi himself has a track record as a sculptor, but his drawings and prints had never been exhibited before last year. Where has he been all this time? Where he can usually be found, out on the land, hunting and observing animal behaviour and habitat. Clearly, Quvi’s keen eye for animal anatomy and movement serves him particularly well in his prints and drawings. We are very fortunate to represent Quvianaqtuq Pudlat and to have mounted his first solo drawings show. While the show remains up on our walls, only one drawing remains unsold. Quvi was also featured in the 2018 Cape Dorset Annual Print Collection. His prints were hanging beside his drawings here at Feheley and they clearly made a powerful impression on our collectors. Nothing is more gratifying for us than seeing a “new” artist emerge from the Kinngait Studios in Cape Dorset. We are in the midst of a generational shift, as the early luminaries of Inuit art are followed by new generation of artists who express their relationship with the world around them in ways that distinguish them from their elders. While many contemporary Inuit artists struggle to capture the grittier reality of life in the Arctic, Quvianaqtuq Pudlat brings more traditional themes and styles to his work. His unique backstory and unquestionable talent represent a new presence in the world of Inuit art. Congratulations Quvi! We look forward to whatever comes next in your work – and to share it with an adoring public. Quvianaqtuq Pudlat – New Drawings runs until November 17th. His prints are available as part of the 2018 Cape Dorset Annual Print Collection.